During 1932, the occupation of the Colombian towns of Leticia and Tarapacá by Peruvian troops and civilians, in the Amazon region, led to a conflict that almost ended in a total war between both countries. Aviation played an important role on both sides, due to the complicated jungle environment, which makes any land movements almost impossible. After some ground and air combats, a ceasefire was agreed and the conflict was resolved. 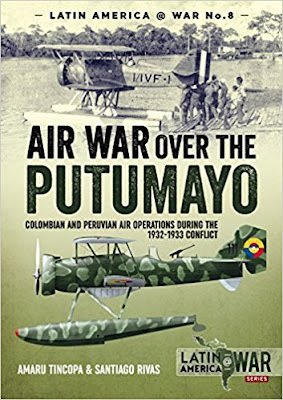 But the war over the Putumayo area became the baptism of fire for the Peruvian and Colombian air forces, leading, in the second case, to the development of its military aviation, which was almost non-existent in 1932. For Peru, the result of the conflict was also a rearming process, which proved important when in 1941 it entered into war with Ecuador. This book is supported by a large number of rare and previously unpublished images, and specially commissioned colour profiles showing camouflage and markings.